Back to the future or in with the new? They're small by volume sold globally, yet huge by volume contained therein. The boats they build are still sought after today, are very distinctive, and considered by many to be the blue water cruiser par excellence. Once upon a time they had sloops in the range, but of late became synonymous with the ketch rig, when everybody else was gradually bringing the main stick further and further aft. They are of course Amel, and they build just a handful of boats a year. OK, maybe you will need a couple of toes in there as well, but the point is that this is a very exclusive space, so the news tat they are going to be launching a new 50-footer around September is big. 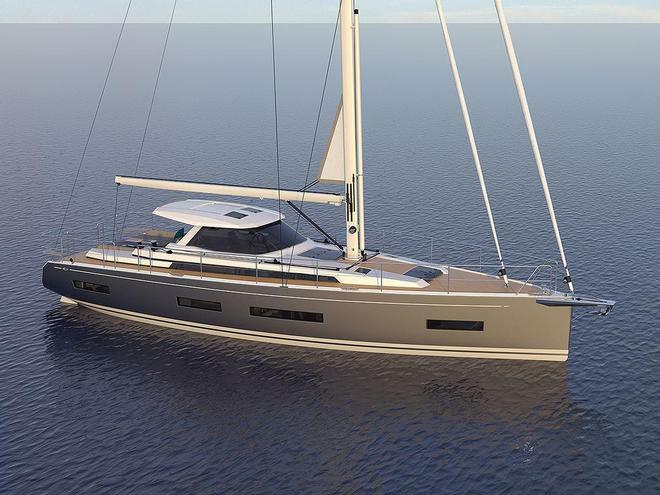 However, unlike the current trend, this new craft is to be smaller than her 55' and 64' siblings, and will come in at 750,000 to 900k Euros, with the first two hulls in full production presently. What strikes you immediately is how this new Berret-Racoupeau design really gives a fresh new take to the traditional Amel approach, stance and poise. The sloop rig, not used by them since the 70's, only adds to the overall theme, with twin rudders and a prodder completing the equation beautifully. In fact, that is the very adjective you use to describe the external and internal renderings you are seeing here. 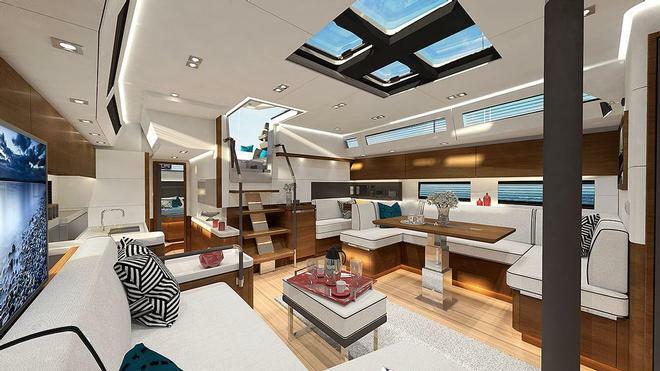 At any rate, the new craft will still be very much part of the stable with things like the solid stainless rails and large, sunken cockpit over the self-contained engine room, and the stylish Pilothouse roofline showing the lineage. 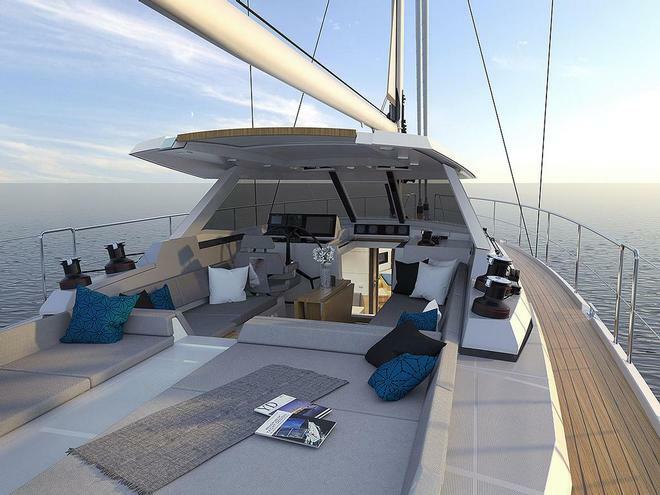 She will also use the 55's mainmast as her own, and naturally deploy centralised and motorised controls for all the key functions. Yes, this is a fresh, new take on the Amel core values; stability, sustained performance during passage making, and value for anyone undertaking serious ocean work. 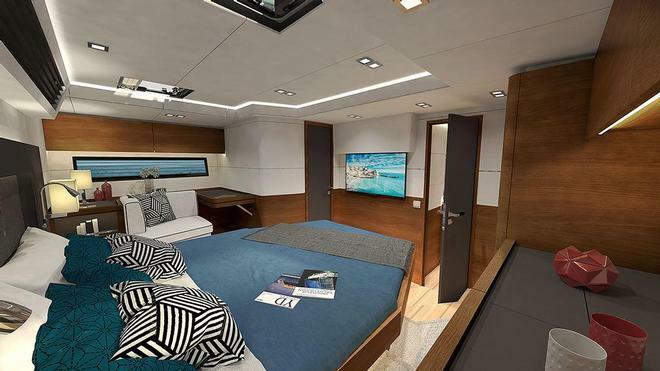 The new craft will have the VIP Stateroom for'ard and voracious Master aft, with the galley along the companionway to maximise the room afforded to the saloon. Like the exterior, these are hallmarks of the Amel buyer, and their requirements for super-comfortable, long haul cruising for a couple with family and friends sometimes joining them. Micah Lane from Australian Agents, Vicsail Sydney/Flagstaff Marine, indicates there will be a virtual tour available during this year's Sydney Boat Show, with the real craft taking centre stage at both Cannes and La Rochelle from the middle of September. Lane was just back from the factory and was genuinely impressed by the project, especially as one craft is apparently being finished in ultra-high gloss Rosewood, which could well mean that the adjective of choice to be applied now has to be, sensational. He also informed me that the first two hulls are not spoken for at present, so if this sounds like the boat you, then perhaps you need to make enquires now in readiness for a 2017 delivery. “The youngest was Lauren at 18, and we had several in their 70s, too. All ages and abilities! You could feel the energy in the room - really hard to describe.” They crossed live to Lisa Blair before her dismasting, which Wright indicated was a highlight at the time, but obviously very sad now. Also evident during conversation was how Wright appreciated the globalised nature of it all, and that they still had members of the group who were from overseas after their forays into the region. All of which pays great homage to the creator of Women Who Sail, Charlotte Kaufman, and her vision. Equally, this ties in very nicely with the Bluewater Cruising Association's Women On Water seminar, which is just days away – April 8 to be precise. OK. In this newsletter you will find that we have tales for you about Lisa Blair and the demise of her record attempt around Antarctica, the World ARC in Polynesia, Arctic Green Ice, Greenland Ice, Sail Port Stephens, Tropical Cyclone Debbie, getting back in the water, the Baja peninsula, Women On Water, sail training, cold water survival, and new choppers for you to select from, and so much more. So you see, there are tales, lessons, inspirations and history to regale yourself with. Please do enjoy... We're loving bringing you the best stories from all over the globe. Remember too, if you want to see what is happening in the other Hemisphere, go to the top and the drag down menu, select the other half of the globe and, voila, it's all there for you.